The Cornish-Fisher expansion is a formula for approximating quantiles of a random variable based only on its first few cumulants. In this section, we define cumulants, specify the Cornish-Fisher expansion, and present an example. where is the q-quantile of Z ~ N(0,1). The expansion is not like, say, the Taylor series expansion, which you can truncate at any point. You must use all terms. If you want a shorter or longer expansion, look up a version of the expansion for less or more cumulants. Using a version with more than five cumulants will not necessarily produce a better approximation. Let’s use the Cornish-Fisher expansion to approximate the .10-quantile of the random variable Y defined by [3.168] in our earlier example. From the first five moments of Y provided in Exhibit 3.26, we calculate the central moments of Y and the central moments and cumulants of the normalization Y* of Y. Results are indicated in Exhibit 3.27. Exhibit 3.27: Central moments of Y, central moments of Y *, and cumulants of Y * are calculated from formulas [3.11], [3.208], and [3.201] through [3.205]. The Cornish-Fisher expansion [3.206] yields the .10-quantile of Y* as –1.123. 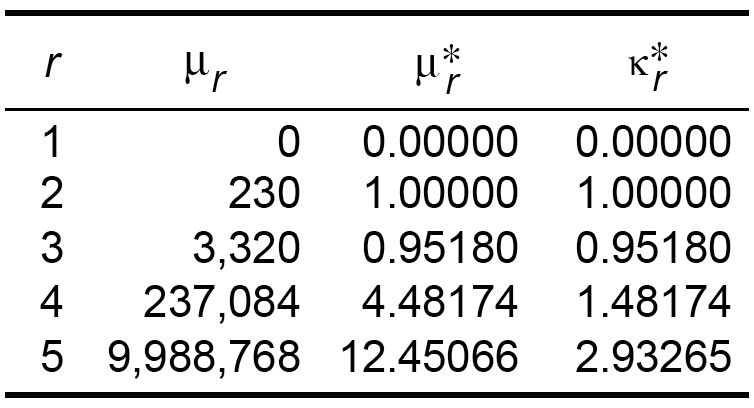 Applying [3.209], we obtain the .10-quantile of Y as –5.029. Using a spreadsheet and inputs from Exhibit 3.27, reproduce the results from the example of this section.